I have been around for a while, and when Western Digital decided to send me their 500 GB hard drive; I drooled. Then Seagate came out with their 750 GB drive; I got goose bumps. 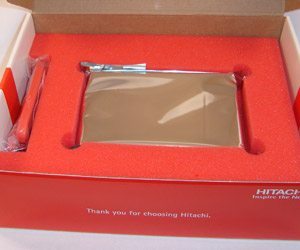 Now, Hitachi decided to realign my particles with their 1TB SATA II hard disk drive (HDS721010KLA330); man this thing smells good. Yeah, if you didn’t catch that, I said 1TB… that’s 1000 GB! Well… technically it’s only 931.51GB, but they measure in decimal not binary. Just a little FYI before we begin, I have had this drive for months trying to kill it. Trust me; I am good at killing stuff. I finally feel it is time for you to read about what I have experienced so far. Similar to the other big honkin’ Seagate drives, this big mofo uses new perpendicular recording technology. That means, its complex in the way it works. I have read some explanations of how the technology works, and some of them are really crappy. I am not going to bore you with my re-wording of someone else’s definition; instead, I am going to point you in the right direction so you can read it yourself. So, what does this thing do that makes it different that some of the other drives out there. 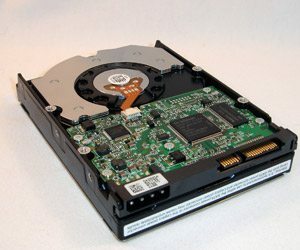 Aside from storage, the HDS721010KLA330 (7K1000) moves data through a SATA II interface (off by default! ), has a WHOPPING 32MB cache, sports NCQ, spins at 7,200 RPMs, has read times of about 8.5 ms and write times of about 9.2 ms. The drive ships with one major feature turned off, cough cough, the SATA II transfer speed. 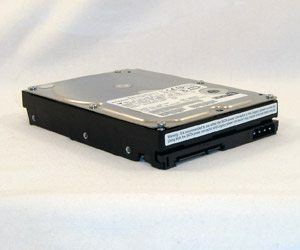 The drive came to me set to run at 150 instead of 300. The really unfortunate thing about this is that they didn’t include the tools to change the standard setting with the drive. However, with some help from the handy dandy search feature on their site, I found ftool ( LINK ) and modified the drive to run like Forrest Gump. 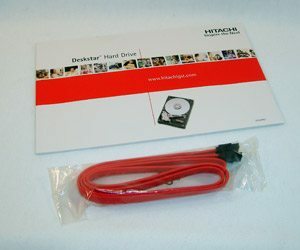 Some of the features Hitachi likes to talk about with this drive are its PMR (perpendicular magnetic recording), the reduced power idle modes, its shock resistance, and the fact that it comes with the 3 year warranty instead of the all too common 1 year flavor. You can get the PMR info at the wiki site listed above. Their reduced power idle modes are a feature set of active, unload and low power modes. Hitachi claims that this can reduce the power consumption up to 20% and that it can reduce heat produced by the drive as well. I cannot speak for the power consumption, but I can tell you that the heat factor is not as great. In fact, with the drive dangling outside of my system on a nice hot summer day, it reached critical temps and locked the system up. A reboot and a quick move to the hdd rack behind the intake fans fixed the issue. The benchmark scores for this drives cousin, 7K500, were very impressive; I am confident it will be more of the same with this drive. The inclusion of a 32MB cache and 200GB platters, coupled with some other decent specs really excites me. For the benchmarks, the test rig is my standard HDD test center. There is nothing over the top here. 2 – 74GB Raptors in a RAID0 Configuration. As with our previous hard drive reviews, the benchmarking will come from various software applications: HD Tach 3 RW, SiSoftware Sandra 2007, FC-Test (thanks X-bit), PCMark 05, Everest Ultimate Edition and a new addition, Iometer. I have opted to omit Winbench 99 because the results were very similar to the NEWER software mentioned. All our benchmarking software is available online so you can try yourself.